Previous post: Are You Good Enough? Next post: Comfortable clothes. Comfortable people. It was early morning. Brewing coffee smelled like breakfast. The dogs were fed and settled into their morning rag doll poses. I stumbled outside with bleary eyes to fill the bird feeder, retrieved it from the hook under the big mesquite tree, and stopped to look at the sky. Another beautiful day. But that’s Arizona. As I leaned over the faded blue plastic tub in which I store the seed, I stopped. Something wasn’t right. I rubbed my eyes and focused. Yes. Right behind the seed tub: a huge rattler coiled and lying quietly. Suddenly its abrasive rattle sounded the alarm. I backed away very quietly and hurried inside. Adrenaline was surging wildly through my now wide-awake body. My wife looked up as I entered the bedroom. She was a picture of peace with our dog, Molly, on her lap. “Rattler!” I blurted. “A big one!” No more peace. I retrieved the gun and checked for snake shot. (If anyone knows where you can buy snake shot for a revolver, let me know. It seems that no one is selling it any more.) Cautiously approaching the snake, which was now in the strike position and swaying, it again flicked its tail a few times to warn me. I stopped and stared. Is that two rattles? Must be a mutant with two tails! It sure is a big one. I realized I would have to pull out the bin to get a good shot. Thankfully the snake remained where it was, ready to strike. I stared again! Two snakes together! Yikes! The male is belly up and therefore appears white. He was 43″ and the female 41″ long. I aimed the gun and pulled the trigger. The first shot killed them both. Of course, I shot a second time just to be sure. When I pulled them out into the driveway to cut off their heads, I saw that they were mating! I guess I interrupted a little romantic moment. Too bad. So sad. I laughed now that the frightening moment was gone and wondered if they knew what hit them in their early morning ardor. Those rattlesnake babies be won’t seeing the light of day, thank you very much! The sad end of a love affair gone wrong. Three years earlier I had encountered a single rattler in a similar encounter. It was my first experience with both my gun and a rattlesnake and I was shaky. It was behind a couch on the same porch and it took me three shots to kill it. I later had to do some extensive patching in the stucco where most of the shot had landed. 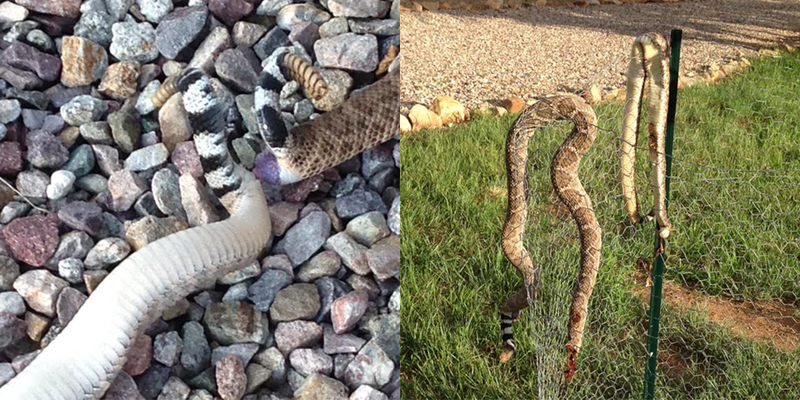 Altogether we’ve killed six rattlers on our nine-acre property. My son-in-law and his boys killed the first one. Such masterful butchers are they! The rattlers were babies, just as deadly. David Shultz enjoys mountain views in Arizona where he lives with his wife and two dogs, Molly and Maggie. Come on. Beat yesterday. You got this!